SarawaK Legendary Of White Crocodile. The name given by Orang Iban,Bujang Senang is legendary crocodile. Bujang Senang most feared terror and attacks against human,berserk and devour human around Sungai Batang Lupar. Croc legend Bujang Senang is crocodile species Crocodylus porosus and measuring 20 feet long and has a white stripe on his back. Crocodiles are said rampant in this river since, 1941. 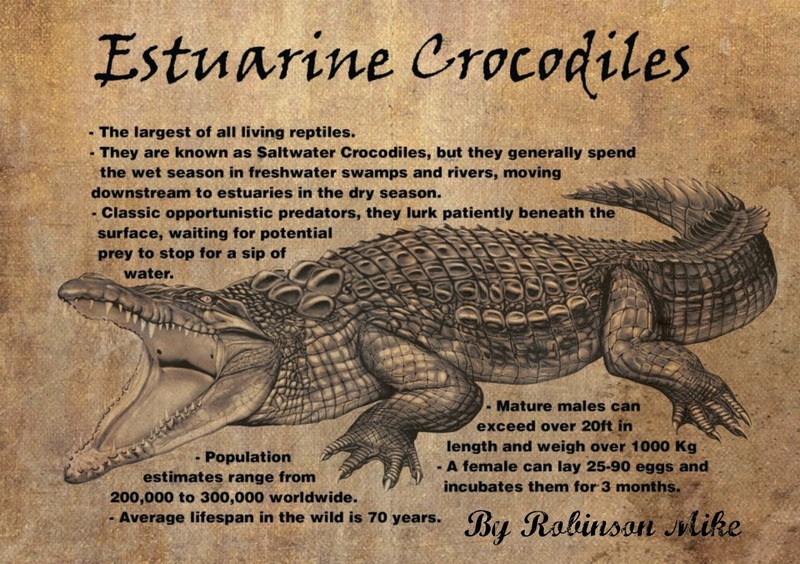 The story of the male crocodile was regular bandied population local. Bujang Senang crocodile said to incarnate Iban warrior named Simalungun. He killed and cursed be a crocodile and he vowed to kill all the generations mistreat them. Simalungun is a Iban warrior known around Skrang river, Sarawak. His greatness is during the expedition Mengayau (Head Hunter) his enemy and the enemies not only a little bit has been killed by him.His greatness is not only Skrang River, but also in river Lupar trunk. Simalungun enemies believe that he has the knowledge tanks that are not translucent brown, and kidnapping his wife so secret immunity Simalungun can be found. They lance Simalungun struck and impaled by his enemies. body Simalungun and his wife left until submerged deck on the river stem the tide Lupar.Lucky the deity who gave miracle on again Lungu poured over his body and magical his wife, and his arrival tide Lungu and his wife turned into a huge crocodile which has a white stripe behind to haunt the descendants of the killers Stick around Lupar. So born Bujang Senang, as is known. Easy self-named Senang Name in conjunction with Senang River, one of Batang Lupar branch where crocodiles Bujang Senang the legends often found. official in their longhouses, he and brother, Kebir,intends to find sustenance living around Batang Lupar.Down the river to the downstream direction, they went into the Sungga River, one of the major branches of the Batang Lupar and start looking shrimp.By using a rake (a container made ​​of cane), their levels of the river along the waist and scoop shrimp.It's already noon a bird name Embuas in Iban Language. (kingfisher), sudden passing them.Kebir feel uneasy, because crossing embuas mean something bad will happen. Kebir call his brother up to the cliff, but insisted Bangan Chieftain shrimp continue searching. Penghulu Bangan began to turn toward brother and flush water through the waist when he stepped on something at the bottom of the murky river.“Nama utai tok, baka batang…(what is this thing, like a stick out)" Kebir had just wanted to reply to the words of his brother w a loud splash strike.Penghulu Bagan disappeared from view. A few seconds later, a large crocodile embossed with corpses Gigantic Penghulu Bagan in his jaw. Kebir continued to plunge and embrace the great crocodile tail in order to save his brother, but to no avail. Kebir realize that crocodile white striped back, length straight home with bad news.Search operations continued for 5 days with the police and the Wildlife participate. Atmosphere surrounding the longhouse sad when corpse brought back only Penghulu Bagan top only.No signs of crocodiles as well as the remnants of bodies were found. Legendary Bujang Senang : Stirau River, Batang Lupar 1984. Badong Anak Apong,from Rumah Nyawin not far from the River Stirau, Batang Lupar. shrimp catch is busy when a large crocodile devours him and observed some of the villagers. Crocodile is seen a tendency to exaggerate Badong before disappearing corpses in the river. Witnesses said the width of the big crocodiles and some drums behind the white line. Efforts were continued and the victim was found 2 days later not far from the scene. Hunting operations run more but no arrests were made. Lagendary Bujang Senang : Batang Lupar 1987. A bird "Embuas" crossing when Berain Anak Tungging being dipped in the river bed of clay to cover the holes in the boat. Once completed, Berain want to return to big banks when a crocodile pulled into the river and this incident witnessed his nephew.With the information same as before, the whole Batang Lupar locals fear with the name of the legendary crocodile Bujang Senang.Tuai rumah ( Longhouse chief ) Rumah Tuah, Tuah anak Tunchun believe that this crocodile Bujang Senang indeed a pleasure and crocodiles the same kill his brother,Inchi Anak Tunchun in year 1962.He was confident that the curse is true and the crocodile is an entity that haunted. He said all the victims involved as brother,Penghulu Bagan ,Badong and Berain directly related and this is not disputed. 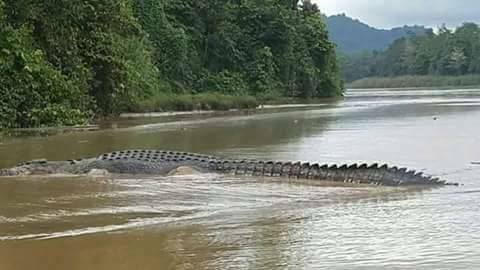 By 1989, numerous reports in the press local newspaper featuring stories the frequent appearance of large crocodiles around in Batang Samarahan and Batang Sadong,seems to reflect something will happen. There are many stories, such as the so-called Bujang Senang has been in the rivers to settle his vendetta along other crocodiles. Lagendary Bujang Senang : Sungai Palaban,Batang Lupar 1992. As usual, the family shadow will move upstream upstream toward their rice fields not far Pelaban River.When water is to be installed, and Dayang help her cross the river to the other side waist-high, before he ascended the cliff. The shadow of his older brother Enie already started working on the farm while their father going back to longhouse to take equipment.Dayang about to go up when a loud splash pulled into the river. Dayang screaming loudly and startled her when her daughter was dragged a large crocodile. Scream, rant and rave to call for help, the people who are directly rushed to the mother Dayang. His brother rushed and with his friends continue to operate track the crocodile. Together they are a shaman named Mandau the incessant reading mantras. After more than 2 hours, Enie found the body of his brother who was still perfectly amid debris at the bottom of one of the river. Somehow, the crocodile back and terrorize.A group of police snipers, Iban hunters, local residents unite to defeat vera. With a couple of shots, regular crocodile fight. Due to the large size of the crocodile, it's hard beat. But still sacred spells and start throwing spears into crocodile head, but broken. The dark clouds, the water began to recede. Big crocodile began to flee towards Batang Lupar, but was stopped by a big wood that spans the river mouth. The crocodile directly attacked, shot and throwing with spear. The crocodile terrorizing and struggled to be a little strange movements. Crocodile turns around and around the wood debris seems to know of his death, and not long after, a large crocodile met a death.This crocodile transported to the longhouse for 4 hours away, and there was a sudden behind the white line. This is the legendary crocodile Bujang Senang dealt, and many police and journalists coming to make report.Unfortunately this crocodile carcasses thrown away into the sea without any effort to bring back to the museum, but his head was brought home by Johnson Jong for public viewing at the crocodile farm in Siburan , Sarawak. Bujang Senang age at time is estimated to be about 50 years old. Rumor of the year 1982 to 1992, a total of 14 people Bujang Senang victims.The actual number of victims is still a Bujang Senang sacrifice a question.Skull of Bujang Senang now on display at the Sarawak State Museum of validity News Bujang Senang crocodile captured still be the talk of population,because there is a point of view that is not a Legendary Bujang Senang,and many more stories.Some Iban community along the Batang Lupar,Bujang Senang believe is still alive,bigger and always be in the river. Some suggest that white alligator is just silence and terrorize return in the future as it was when he went back in 1982.Because that's where they trap a baby crocodile purse, they will release it as an apology. This is all to avoid untoward incidents happen to them and their descendants.Until now, the stories of the crocodile attack in Sarawak often associated with Legend BUJANG SENANG..
Who is not familiar with Bujang Senang that are the most dangerous predators in the river around Sarawak. Already many of the victims are devoured by animals. Recently, a student five years old have been eaten by a crocodile in front of his eyes. They were attacked while taking a bath in the river. Current efforts underway to track catch crocodiles. 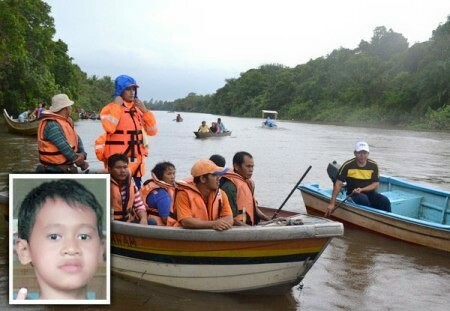 MIRI - A fifth-year student of Sekolah Kebangsaan (SK) Kampung Iran Suai died after being attacked by a crocodile in the incident in Suai river near here yesterday. In the incident at 10 am, the victim, Jerry Apat Swan, 11, a native of Long House Sulang Suai understood down to the river with two friends for a bath. However, his intention was not to be after the four-meter crocodile believed to devour the poor boy left thigh before being dragged into the middle of the river. According to the source, based on the testimony of friends who declined to be named, Jerry was washing her clothes on the quay before being attacked by the ferocious reptiles. "His friend was stunned to see the victim's body and pulled the crocodile tossed into the river continues to escape and ran back to the village to inform the incident to the family of Jerry. "After receiving the news, the father of the victim, Ludang Swan, 45, together with the villagers rushed to the scene but vicious crocodile sightings have been missing," he said when contacted here today. ROBAN : The search for river fishing Adrian Thomas , 32 , is missing believed eaten by a crocodile nicknamed ' Single Seblak end with the discovery of the body without a head , hands and feet , yesterday morning . 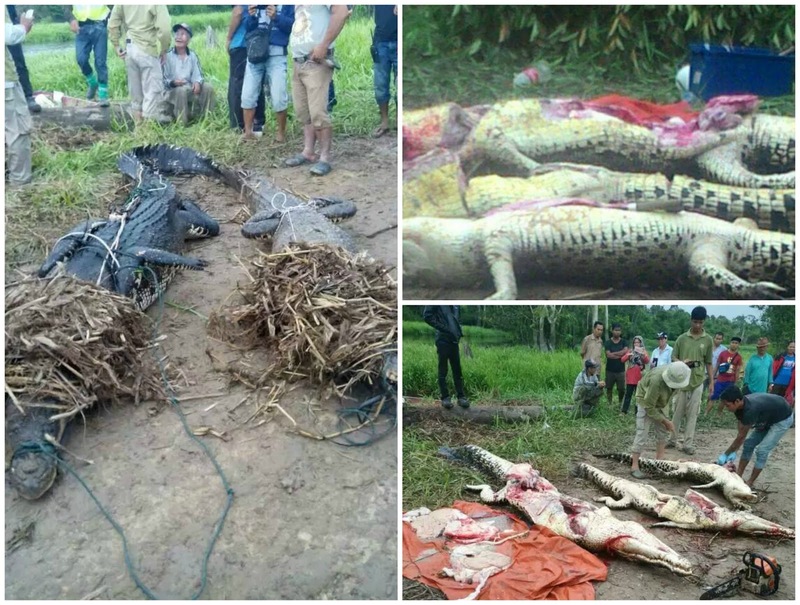 String heartbreaking discovery of the bodies began when villagers who joined the search for victims on the River Seblak seen strange behavior crocodile estimated to be over 16 feet shook his body and ripples of water before spewing human body . Witness the scene, Mani Mangai , 50s, residents of Homes Mawan Ason , Empayak , Roban , said of her life, that's the most bizarre incidents ever seen.
" We are very surprised when a crocodile roughly along 16 feet , dusky colored suddenly appeared a few meters from the edge of our boat , as the water ripples and spew something out of his mouth , " said Mani told media at the long house boat jetty involved , yesterday. He said that at first they thought crocodiles involved plastic vomit , but a few minutes later , they started to smell foul. "Worried that matter, we continue to strengthen our boat and things involved while pulling de -ngan boater. "We are then surprised to find that it is part of the human body , which is part of the waist to shoulder level." According to Mani, during the incident they were on their way to inspect the alligator hooks were installed in an effort to catch the crocodile which is believed to devour Adrian on Friday afternoon." As soon as we discovered the bodies involved directly back to the longhouse to inform the villagers, " he said. 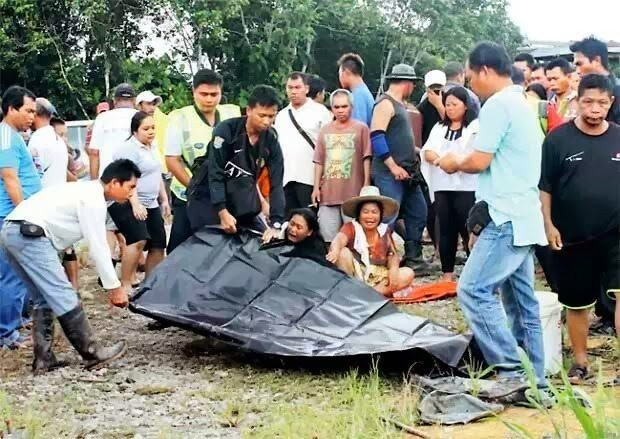 Mani was found dead along with three friends, namely Indet Senabong, clairvoyant crocodile is no stranger among the local population, the father of the victim and the Harvest House Embol. Indet 50, said the bizarre incident occurred at the mouth of the River boy, at about 500 meters from the location of the victims believed to be attacked." The people here, the location was known as the Gulf Berauh.The incident happened at around 9 o'clock .
" For us , this sign is a good thing and prove that the loss of the victim for this has to do alligators, thus repelling talk some parties that the victims lost in the woods nearby, drowning and some other notions." At the same time, this incident shows that crocodiles are responsible are starting to feel the effects of the work that we have carried out, " he said. Thus, Indet hope to catch the trusted bedal devours Adrian will soon bear fruit . Indet renowned for its expertise in subjecting the crocodile when he was captured in a 12- foot crocodile in the same river on July 3 last year. In the incident, which involved a crocodile believed to devour Munsong Siah, the wife of Harvest Home Embol Son River, lost in a single volley at his head. Meanwhile, when residents gathered in the longhouse jetty while waiting for the police to bring the bodies to the hospital Saratok, they are shocked by the news of the Sarawak Department officials that there were signs that one of the hooks installed by the handler involved had to do. Thereafter, Indet , Mani and Harvest House Embol rushed to the location, but around 2 pm yesterday, the group returned to the longhouse and confirm hooks involved have yet to do. R.I.P Adrian Thomas. Crocodiles (Crocodylus porosus), also known as the frog crocodile, alligator and crocodile saltwater estuary. Longer than seven meters (23 feet). Can produce 60-80 eggs at a time. The first crocodile (Tomistorma Schlegelli). Is longer than four meters (13 feet). Can produce 20-60 eggs at a time. Sarawak Sungai Buaya in most of the species Crocodylus porosus crocodile, better known frogs usually live in freshwater and saltwater. 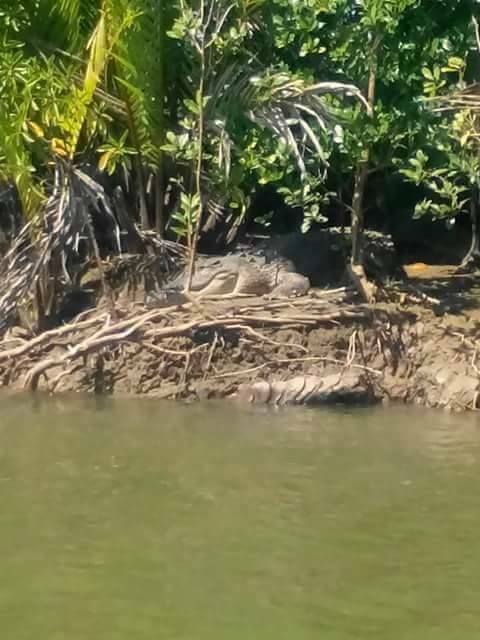 Saltwater crocodile measuring four to six meters long, has a white stripe on her back and said to be over 50 years old and was mighty in Sungai Batang Lupar since 1941. 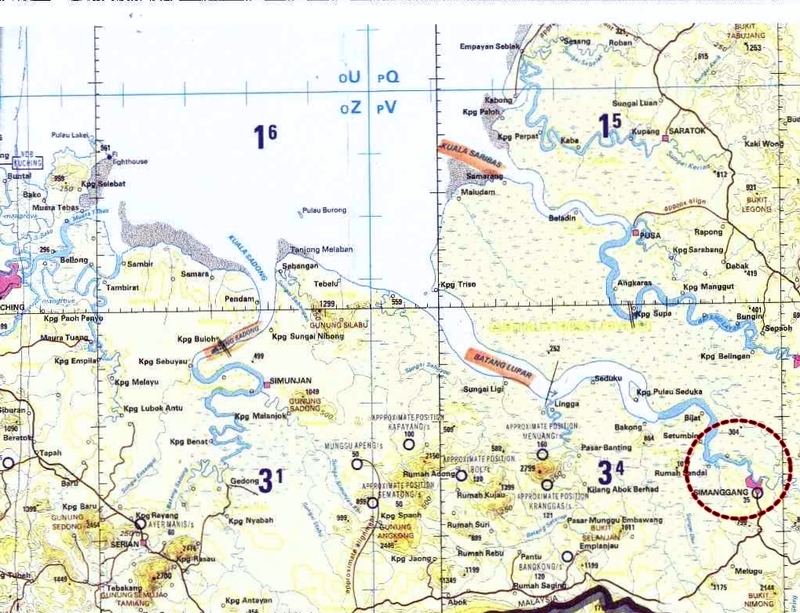 Local residents claimed that the Sarawak Single Pleased overall size of 30 meters with a white body. Adult male crocodile measuring five meters long, but there are crocodiles longer than six to seven meters and weigh between 1,500 and 2,500 kilograms. Female crocodile alligator smaller than males with an average length of between two and three meters. It said, among people who are victims of Single Glad, none of Bidayuh because of the agreement between the bedal with Bidayuh descent. In the 1980s, people in this country have been perplexed by a crocodile violent events called 'Single Happy' that inhabit Sungai Batang Lupar in Sri Aman, Sarawak attacking and devouring the prey. Around 1982 to 1991, during the seven-meter reptile devours 13 villagers. After killing the 14 victims, the animals were killed Iban hunter and policemen. Crocodile attack in Sungai Batang Lupar often associated with Single Glad until the reptile was killed on May 22, 1992. Niah. In the incident, the victim involved did not seem as good to jump into the river. His body was found floating four kilometers from the scene of the injury in the thigh swelling and crocodiles. In the incident at 6 pm, Mohamad Azlan Marzuki, 20, from Kampung Haji Mat Taib, Kuching bleeding profusely on the right foot after allegedly bitten by a crocodile while bathing in Pasir Panjang. He thought it was a stick alligator, suddenly bitten but managed to escape with the crocodile head kick. An Indonesian construction worker who was defecation almost eaten by a crocodile pit under the bridge across the Sarawak River near Borneo Convention Centre Kuching (BCCK). Pai, 32, from the island of Java said, suddenly more than two meter long crocodile grabbed her waist from behind and managed to escape with all my might punch the animal's eyes. Form two Secondary School (SMK) Sungai Maong, wounded in both thighs due to be devoured by a saltwater crocodile while bathing in beach sand Pandak holiday Eid celebrations. Austin Ashley Chin, 14, survived after punching the eyes and the body crocodile along more than three meters. After three days of search operations conducted, ultimately corpse Derahman Chali, 55, was found in a terrible state when the victim's head was almost severed and only the left side while the right side of the body at shoulder down the right hand and right leg, lost. The body of the elderly is found across the River Nam village, which is 20 kilometers Spaoh from the scene, struck Single Saribas when washing hands in Sungai Saribas in Beladin. Deep love for his wife causing embolism Asum, 43, is willing to pawn the soul wrestling with alligators along six meters for almost 10 minutes for her release, which devoured by reptiles in Sungai Anak, Roban. However, the effort failed when his wife, Munsong Siah, 42, pulled the animal into the river. His wife's body was found tangled in the nets in perfect condition with wounds from being bitten by a crocodile. Difficult moments encountered a mentally ill when forced to fight with the crocodile for 15 minutes while bathing in Sungai Batang Sadong. CANDIDATE Saga, 43, from Kampung Spaoh Jawey, Building to the river to bathe in the river, which is located 50 meters from his house. 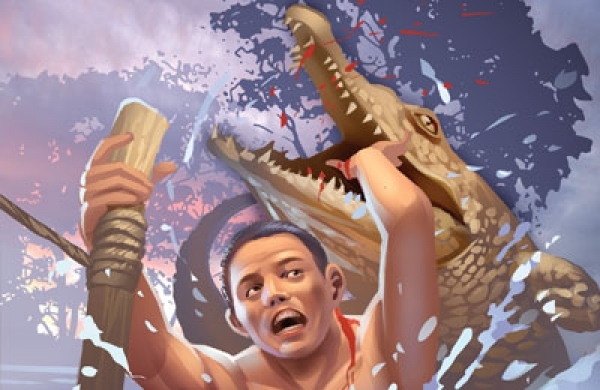 Even though his left leg was bitten by a crocodile, he managed to escape by punching the crocodile's eyes. Millie cake, 36, survived the war after struggling and kicking the crocodile tears that dragged a distance of two meters into the river. More than three-meter crocodile that appears in the River Chebar, Batu Niah and bit his right leg when he bathing 6.30am. Sungai Nakat, Miri on 10 April 2016. Three adult crocodiles have been removed from Sg. Nakat, Bakong near here as a result of culling operation led by Sarawak Forestry Corporation's Wildlife Action Team (SWAT). The culling operation was carried out subsequent to the discovery last week of human body parts believed to be that of a missing local man, Richard Shutie Tambi, 57. "SWAT, with the help of the local villagers set up baited hooks along the banks of River Nakat where the victim was allegedly taken by a crocodile. 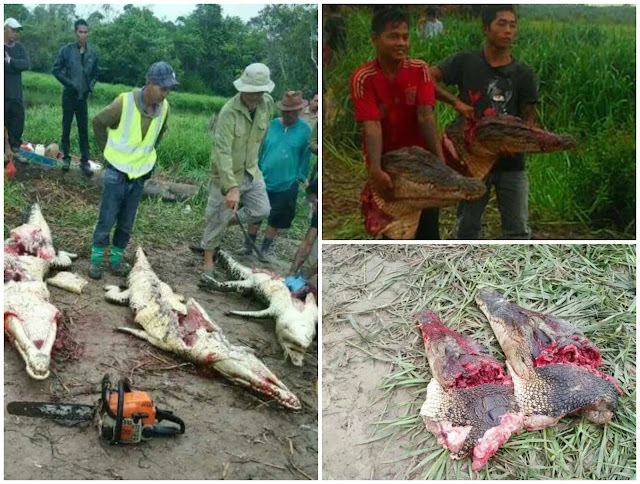 Three adult crocodile, one male and two females measuring 3.85meters, 3 meters and 2.55meters respectively have taken the bait and were captured. ''At the behest of the relatives of the alleged victim, all three crocodiles were cut open and their stomach contents examined for human body parts. However, no body parts were found in any of the crocodiles. The question is are those croc's that they have been catch are the one whose killed the children?? or they got wrong crocs, if they got wrong one, the revenge will begin from croc's. I Love Adventures and thank you so much for you'r visiting.
" I love to travel but hate to reach"